It was an urgent trip to go to Taiwan and within half an hour of my arrival, the Japanese party had planned to arrive in a flight just half hour later and we met in the late evening to discuss about business in Taiwan. But the discussion on opening up Taiwan is still early and the bulk of the preparation is with the US office and I brought along in my trip to US the man who can help us in Taiwan. Intense meetings began before the US Thanksgiving day which continued to the end of the year through tele-conference calls after we got home. We were creating an A-Team or the eXfuze Team in Asia! With one of the investors of eXfuze, Michael Seymour in the center. Today is the funeral of Mervin Chan, a member of the church whose name is quite familiar with most members in Singapore from the pioneer days. As I am with Han enrolling him to driving school in KL, we are unable to attend the funeral. 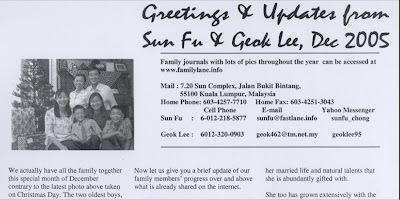 Geok Lee messaged me that he had passed away a few days earlier on Nov 12. Living or Dead, I'm one who is always interested to connect to the individual, asking questions like when did we first meet, who is related to him that I know and reflecting upon the time we have shared together. For the past few days, I kept thinking about Mervin and searched my memory and went through my archives of photographs and realized I didn't really know him that well. It was only until recently when I met him at the same ward as Geok Lee at the cancer hospital in Singapore last year that I got to know him better. He was always an active member at church meetings and socials. Above is seen at the farewell party for Oh Chong Keat and Wyndia family in Nov 2007. His whole family seems to have joined the Church. Pictured at Church in the Clementi Ward is his mother and sister Delicia who served a mission in Malaysia in our KL branch before. The rest are his other sisters Irene, Serena and Eric who now resides in Canada. Wonder if we missed out any others? Just earlier in the month on 2 Nov we heard he was at the hospital and had a chance to see Mervin alive for the last time. Being such a familiar person to all the saints in Singapore, I believed many visited him at the hospital too which would be tiring for Christina, his wife, who has been a positive and supportive partner in his life. May God continue to bless the Chan family and Mervin too. I think he is now happy to meet many of the people he has become familiar with that have also departed and may have left behind a legacy or fond memories of them. ...that you need to learn how to walk before you can learn to fly! Always aim high and soar to the skies! You can do it! Ray celebrates his 11th Birthday! Ray celebrated his birthday on a day typical of life, one filled with happiness and another of sadness. Just after Church on Sunday at noon time, a new convert was getting ready to be baptized into the ward, symbolic of being born again to a new life. We heard that another church member of the ward, stricken with cancer of the liver for some time, was now in a critical situation at the hospital and we went to visit him. In the evening, it was time to celebrate Ray's birthday with a special dinner plus cutting the birthday cake. He was as usual anxious to open his presents and just as he was about to open Dad's presents to him, I related the significance of the presents to my advice to him about life. 1) One was that he should always be organized in life. 2) The second was that he should follow his north star. 3) The last was that he was to be the one to label his own life and not worry about the label that others might give to him. Can you relate his presents below to the advice given above? That's the end of the object lesson given by Dad to Ray through his birthday presents. Some food for thought as he prepares to move on with his life for another year till his next birthday!